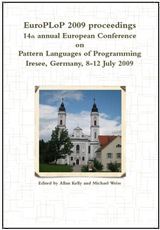 EuroPLoP 2011 will be held July 13-17, 2011 in the Irsee Monastery, Germany. Join our Yahoo! group to stay updated. Early registration ends May 23. The reduced fee for early birds is EUR 800. Afterwards the regular fee will be EUR 900. Acceptance notification for Workshop or Writing Group (Onsite Shepherding) sent.